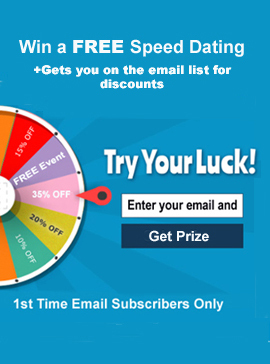 Long Island Speed Dating events and more since 2003! Over 67 married couples. We run the most ORGANIZED Long Island singles events in the Nassau County and Suffolk County areas and were voted Long Island Press Best Dating Organization in 2010, 2012 and 2014. Use the box below to search for LONG ISLAND SINGLES EVENTS Only. If you are new to Speed Dating on Long Island events, check out our guidelines for choosing the right Long Island single event. All events are not created equal. The guide will give you some information in advance that may help you make a decision on which company you want to go with. We have all types of Long Island singles events (speed dating, speed bowling, volleyball, darts, Broadway Shows, mingles and more). Long Island events take place in East Meadow, Huntington, Woodbury, Hicksville and other Long Island hot spots. Long Island Speed Dating events draw singles from Long Island and the surrounding areas. We adhere to our age groups and do not mix multiple age groups together. We are probably one of the only Long Island dating groups that requires proof of age at most events. 75+ engaged couples, 67+ marriages and a few babies later, we are still going strong. Please feel free to call Jay at 718-757-6933 with any questions after you have reviewed the website.. Thanks to your many suggestions and feedback received over the past 11 years, it is not just for Long Island singles anymore. Many of the events modify the speed dating format to an activity and we now have events in Manhattan and Connecticut.. These events are structured so that you get to enjoy the activity, but are also ensured to meet everyone who attends by incorporating a rotation factor. This eliminates any awkward entrance to exists to conversations.